Lisa Caberlotto ’17 (Italy) will pursue a Bachelor of Science in International Economics and Finance at Bocconi University, choosing the renowned business and management school over Durham University, the University of Exeter, the University of Bath, and the University of Nottingham. 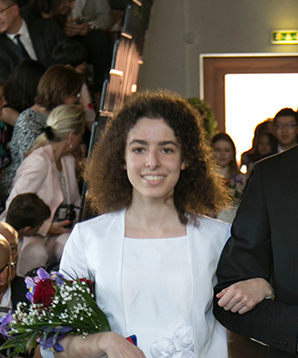 Lisa, who came to TASIS Switzerland for her senior year after spending one year as a boarding student at TASIS England and three summers in the TASIS Switzerland Summer Programs, earned a Bilingual IB Diploma in English and Italian (she also speaks Spanish and some German), securing an impressive 38 points on her assessment. Outside the classroom, Lisa also made the most of her one year at TASIS. She worked with Red Cross to help teenage refugees; served as a member of the Service Learning Board in order to promote volunteerism among the TASIS student body; helped establish a relationship between TASIS and the OTAF Foundation, which has led to a new local Service Learning group this year; attended the Global Issues Network (GIN) Conference in London to discuss and raise awareness of major global issues; played tennis and basketball; and helped organize the Senior Prom. A Dean’s List student each semester, Lisa believes that her one year at TASIS shaped her future plans and readied her for the next step. TASIS owes a great debt to Lisa for her remarkable contributions to the community, and she is likewise grateful for all the School offered her.